Today, we're bringing readers one of the best biotech stocks in 2017, a pick from Money Morning Executive Editor Bill Patalon. He's not the only one bullish on this stock. Some Wall Street analysts estimate this biotech stock could soar more than 100% in the next 12 months. Increasing biotech drug sales in the United States will be a major catalyst for this stock. Biotech sales are expected to hit $128 billion in 2019, according to FactSet. Sales in 2017 are expected to come in at $107 billion. That's a nearly 20% increase in two years. The biotech company we're talking about here develops cancer and pain treatments. Pain treatments alone were a $60 billion market worldwide in 2015, according to Transparency Market Research. 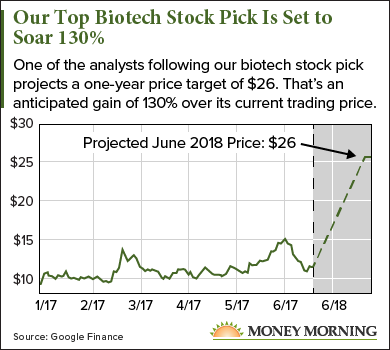 This top biotech pick is introducing a new cancer drug to the market in August that is expected to push the stock to new highs. "If you really want to cash in, commercialization [of this new drug] is the 'triggering event' that can make that happen," according to Patalon. On May 15, Patalon told readers about the opportunity in this biotech stock. A few days later, on May 24, the FDA gave final approval for the company's new marijuana-based medication that treats chemotherapy-induced nausea and vomiting. The new medication will be available in August and has the potential to help millions of patients. In 2014, there were almost 15 million cancer patients in the United States, according to the National Cancer Institute. And 80% of them suffer from chemotherapy-induced nausea and vomiting. But that's just the current FDA-approved use of the drug. Studies have shown the active ingredient also treats pain, which could open up a new market for the medication. In 2015, the pain treatment sector was worth $60.2 billion globally, according to Transparency Market Research. By 2024, global demand for pain treatments is expected to grow to $83 billion.